Why did the 1917 American Red Cross Mission to Russia include more financiers than medical doctors? Rather than caring for the victims of war and revolution, its members seemed more intent on negotiating contracts with the Kerensky government, and subsequently the Bolshevik regime. • The role of Morgan banking executives in funnelling illegal Bolshevik gold into the US. • The co-option of the American Red Cross by powerful Wall Street forces. • The intervention by Wall Street sources to free the Marxist revolutionary Leon Trotsky, whose aim was to topple the Russian government. • The deals made by major corporations to capture the huge Russian market a decade and a half before the US recognized the Soviet regime. • The secret sponsoring of Communism by leading businessmen, who publicly championed free enterprise. 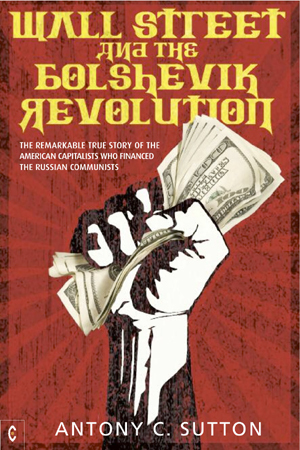 Wall Street and the Bolshevik Revolution traces the foundations of Western funding of the Soviet Union. Dispassionately, and with overwhelming documentation, the author details a crucial phase in the establishment of Communist Russia. ANTONY C. SUTTON, born in London in 1925, was educated at the universities of London, Gottingen and California. He was a Research Fellow at the Hoover Institution for War, Revolution and Peace at Stanford, California, from 1968 to 1973 and later an Economics Professor at California State University, Los Angeles. He is the author of 25 books, including the major three-volume study Western Technology and Soviet Economic Development. He died in 2002.